A couple of days ago I wrote that the value of my dividend growth portfolio isn’t all that important on the road to financial independence because I’m focussed on building passive income rather than capital. So why don’t we take a look at that income? More specifically, let’s see what March and April brought in terms of dividends? 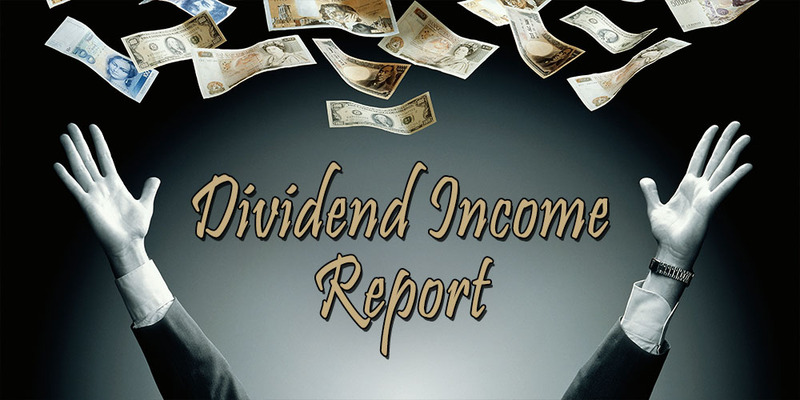 As most of you know, I think these dividend reports are a great way for you guys to see what it takes to build a portfolio that generates enough passive income to live on. You can follow along how quickly (or slowly, of course!) I manage to make money that’s completely free-of-work. And as an additional bonus, I get to reflect on my strategy, my buys, and any actions I might take going forward. Investing isn’t always easy, but the income portion of the dividend growth investing strategy takes the edge off market girations for me. Since dividends are a recurring phenomenon they act as a reinforcing stimulus that keeps me focused on what’s important: living below my means, saving as much as possible, and turning those savings into cash-generating assets. And that’s just what I’ve been doing for the past two years. I’ve taken advantage of the power of compound interest. On the one hand I kept re-investing my dividends (although not automatically like some people do using a DRIP or dividend re-investment plan), while on the other most of the stocks I own, kept increasing their cash distributions to shareholders. Previously I’ve called this double dipping since both effects reinforce one another. Of course, there have been difficulties. I mistakenly bought into pipeline operator Kinder Morgan (NYSE:KMI), miner BHP Billiton (LON:BLT) was forced to slash its dividend by 75%, and the Belgian federal government increased dividend taxation by 2%. Nevertheless, I’m really happy with my progress thusfar. One of Swedish pop group Abba’s most famous songs “Money Money Money” tells the story of someone who works all night and day to pay the bills, and is sad about it. Thankfully, that’s not the case for me. Sure enough, I still work full-time to get my financial independence plan off the ground, but I can already rely on a pretty heft passive income stream. No less than sixteen companies forwarded me a piece of their profits during March and April. That’s roughly the same number as last year, but the amount of cash coming in grew by leaps and bounds because of the aforementioned double dip approach. Let’s see what’s what! All dividends below are listed in Euros, and are after foreign withholding taxes and a 27% income tax levied by the Belgian federal government. There you have it! Both March and April come in over the magical €100 mark, with March’s dividends totalling €109.50 and April’s €111.03. This is the first time I’ve had two consecutive months bringing in more than three figures, which is really exciting and bodes well for the future. However, the previously mentioned dividend cut from BHP Billiton ate into March’s expected return. Thankfully British healthcare player GlaxoSmithKline (LON:GSK) decided to pay a special dividend for its oncology business swap with Swiss Novartis (VTX:NOVN). All in all, March and April are a strong foray into the European dividend season that’s currently going on. These numbers are nice and all, but they hide the special ingredient of dividend investing: the growth component previously mentioned. 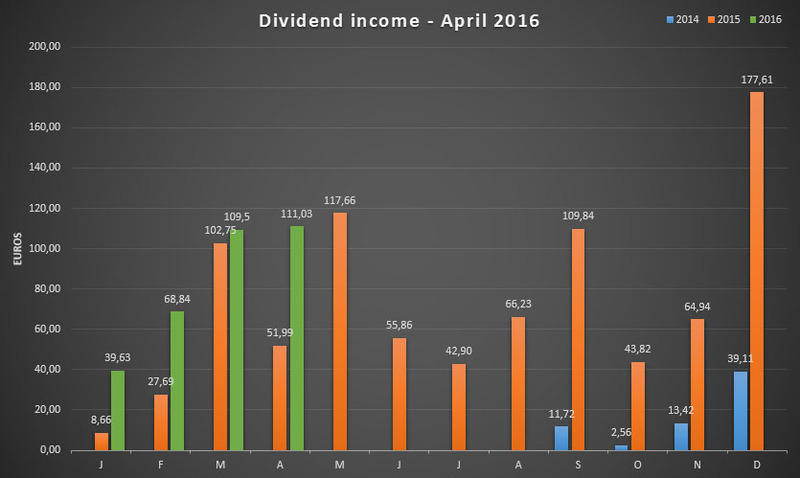 It might not be obvious, but a small portion of the dividends received in March and April came to me automatically through increased cash distributions by the companies I own. For example, Munich Re-insurance (ETR:MUV2) payed out 6.5% more than last year, while distiller Diageo (LON:DGE) bumped its semi-annual dividend for the year by 5%. As a result, March’s numbers were 6.57% higher compared to last year – even with the dividend cut from BHP Billiton and the jump from Novartis to February. April performed even better with a triple digit growth number: 113.56%. Highly impressive! As a result, my average monthly income for the entire year stood at €27 already at the end of April. “It’s just 27 Euros, not that much” I can hear you say, but when you consider that this level of income covers all my telecom needs for the entire year you’d probably think again. Of course, I’m not stopping here. That’s why I bought into French healthcare giant Sanofi (EPA:SAN), which should pay me a handsome yield in May. As a result, I’m looking forward to May’s numbers, not in the least because its the biggest month of the year for most European dividend investors. I’ve previously mentioned that I’m trying to create my own Win for Life lottery ticket by rigorously saving and investing. The past two months mark another big stepping stone towards my own Win for Life fund with both nice income and growth numbers compared to last year. However, I may have been a bit too ambitious setting my income goal for 2016 at €1,500 for the entire year. With the previously mentioned dividend cuts it’ll be tough to crack that number this year without going into ridiculously high and unsustainable dividend yield territory. Of course, I’ll continue doing my best and we’ll see where I end up. But first, let’s see what dividend month extra-ordinaire May brings us! nice to see your dividend income growing, it`s good for motivation… sometimes there are moments it`s realy tough to keep up investing, because the progress looks so “slow” but when the next dividends come in that`s such a nice feeling and you put more and more money into the stock market and dividend income growth quarter over quarter and year over year! Investing is so much fun, especially when a few months later the first dividends come in! I hope the may was a great dividend month for you too, but i think it was!! Thank you for the great work and answering at every comment!!! Getting your portfolio and dividend income off the ground does indeed take a bit of time, but once it does… Oh, boy! My spirit and motivation always peaks when I see a new dividend rolling into my account. Munich RE trades at a really good price in my opinion, so I think you’d do well to take a close look at the stock. If I have some more room in my portfolio and if the price stays low I might double down. May is turning out great too, even after one of my largest positions moved its payment date to December due to tax changes last year. A third month with three figures is in the works! Hope you’re doing great too over there. Thanks for sharing your Portfolio, interesting, stable companies. Thanks, VTB! I’ll keep pushing forward! Great dividend income you’ve got in march and april. Keep the snowball rolling. Now I’m looking for an Investor that will invest in my Ecommerce that I’ve started in May 1st. Thanks, buddy! Glad to hear from you. I just took a quick peak at your eBay store – I hope it turns into a viable business opportunity for you! A long time ago I used to collect stamps too (from Belgium). Turned out it was a bit too expensive to maintain as a hobby, so I switched to post cards from my home city… That got expensive too quickly, so I stopped collecting all together. Two great months there, NMW – congrats! I hope to hit the £100 per month in income sometime this year! Keep up the great work! Thanks, feels great seeing the numbers tick upwards! And with the showers of dividends from European companies the past couple of weeks it seems like there’s no end to the growth. Hope you hit the £100 mark before long! Congrats on hitting +100EUR twice in a row. I received my last dividend for May on Friday, it was my first month with dividend income in excess of 200EUR. Thanks, it’s a big achievement in my book! And May is turning out to be another €100+ month, so I’m super excited about that. You’re also pumping out impressive numbers. May sure is an awesome month to be a European investor! Congratz on having 2 100+ months in a row. Looking at the graph, May will be extraordinary as well! Could well be your best month ever! Thanks, man! Appreciate your enthusiasm! May is turning out to be a good month too, but sadly it won’t be my best month ever. Home Invest Belgium (HOMI) switched from an annual payment to a semi-annual one (due to the tax changes last year) with its largest payment in December. So I think December is going to be my biggest month again. I’ll be really happy if I manage to trump last year’s number for May! Than you had at least 2pct more net income! DGI has bitten me… I plan building a Beglian skewed portfolio. Keep on going the path is long, sometimes difficult but if you keep focused you will succeed. Anyway, in order to reach your goal quicly and achieve your dreams, my advice to you, would also to consider investing in real estate as you invest other people’s money and benefit the leverage effect given by the bank loan. 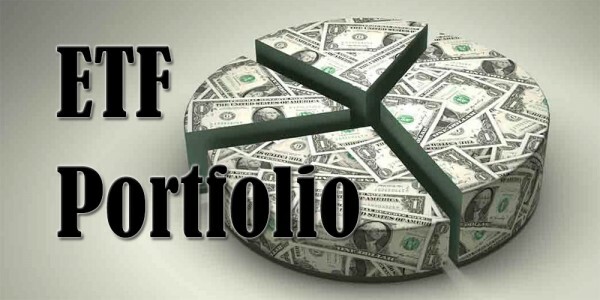 As a young man with a good job position, you could easily borrow and invest in high yield real estate (>10%/year) compared to credit cost (2%/year) you will be in position to generate positive cash flow that could feed your dividend income snow ball. Best regards, and by the way dividend income investment gave me an other reason to love May ! I appreciate the kind words! I hope my spreadsheet serves you well. I’m currently working on a new version and already added the companies from the SPYW index to the list – thhank you for the suggestion. Investing directly into real estate is something I’m not interested in for a couple of reasons. 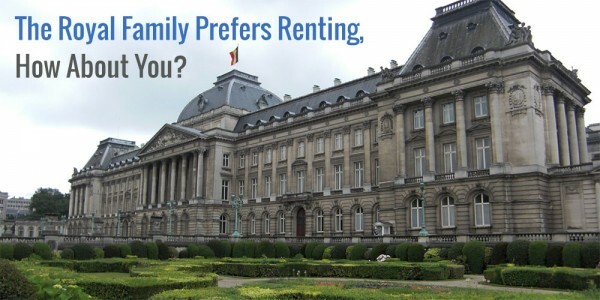 First, I believe housing prices are overly expensive in Belgium while renting is relatively cheap. As such, the return isn’t too great. Second, I don’t want to have to deal with tenants and all the other administration that comes with renting out a place. My solution to the above has been to invest in Home Invest Belgium (HOMI), which is a REIT that focusses on high-return properties for personal and commercial use. So far HOMI has served me very well. May is turning out fantastic! From your comment I gather you’re also rolling in dividend income, yay! I have been following your blog for quite some time, and it has been a great inspiration for me. Without thinking about it too much, I have been following the same goal. Your blog showed me how structured you can do it (and how unstructured I did it before). Especially impressing I find how you created constant inflows – take March and April, almost the same amount. So, still a long way to go, but without your blog, I would have taken much longer time to figure things out – thanks! Glad to hear I’ve inspired you in some way, shape or form! And I’m happy that you are also striving for financial independence in a structured manner – in my view, that’s the only right way to go about it. Constant dividend income is nice because it helps smooth months over, but it doesn’t matter all too much in the end, I think. I focus on high quality companies with a sustainable dividend first and foremost. Best of luck building your passive income stream! I am a fellow shareholder. I own 22 shares of Munich Re. The page you have linked does not have to do with purchasing the shares of the company. You cannot buy stocks directly from Munich Re. You have to do this – as you for sure already did – via broker. The text on the page just explains that shares of Munich Re are registered shares. Which means: the company knows your name, address, date of birth and the number of shares you own. I understand,,, i thought there is a direct purchase program like some US or French companies . Which broker do you recommend to use ? i am living ouside the US and Europe. I’d look for a domestic broker if I were you. It might turn into a fiscal or legislative nightmare if there ever was to happen something internationally… You don’t want to lose all your hard-earned money because of that. Rickrack is right. You can’t purchase shares directly from Munich RE, but you can register them. There’s very few advantages to doing so, I think. is this the reason you use a domestic broker although they are more expensive than, for example, IB interactive brokers ? I use a domestic broker until now that is the same Israeli Bank in my case… but is so much more expensive than IB for example…. sorry for my late reply. I am not familiar with the situation in Israel. 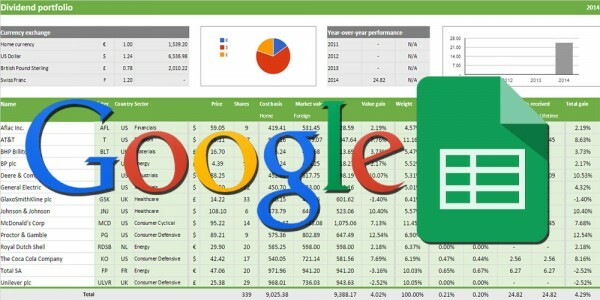 There should be online broker in your country which you should check and compare. Good luck for next months. Thanks! Glad to be a fellow shareholder, especially of Unilever and Johnson and Johnson – two of my favourite companies out there. Too bad that you won’t be able to get to your target for the year. But two €100+ months is still pretty good! As to your net worth comment, maybe a combination of capital gains and dividends is the way to go? Guess you should never bet on one horse? Make that three months of €100+ in a row! May turns out to be way better than what I expected. Capital appreciation are likely to be a long-term driving force too in my portfolio, but I expect dividend income to be more stable over time, thus smoothing out any ups and downs in the market. Now that most indices are at all-time highs it’s hard to see marked capital gains, but I’m sure most of the stocks I own will grow over time. Finally nice to see your March report. Been missing these updates. Nice totals for both recent months with many names in common paying us. Keep on doing what you’re doing. Keep building that passive income stream and you never know… you still may hit your dividend goal after all. Always love reading these updates. Thanks for sharing. A whole bunch of companies slowly making both of us rich over time – what’s not to like?! Even if I don’t make my goal for this year, I’m still in an awesome position for future success. Wow, that’s a big number, 26% YoY! I’ll be rooting for you guys from across the Atlantic, but with your savings potential you’ll surely crush the $13,000 mark. So basically, on a 44.000€ share portfolio, you’re looking at at least 1000€ in dividends this year? Plus the appreciation in value. Not bad. My forward yield is about 2.7% (after taxes) at the moment if I’m not mistaken, which isn’t too bad in the low-interest environment we’re currently in. I’m looking forward to see that number grow over time though. You’re absolutely right that ethics are an important part of investing. Last year we’ve had a discussion on Tobacco stocks – I’d never invest in them even if my life depended on them. It was very interesting to see the different perspectives on the issue. I understand why you’d shy away from BP, but please tell me what you don’t like about Unilever? It is one of the major consumer-oriented companies out there that puts heavy emphasis on sustainability. you really are making progress! Congratulations on two times over hundred €. Looking forward to reading your may progress. I had a good April with dividends of 480€. May should be nearly twice as high. A lot of dividend growth investors got burnt with BHP and KMI – although I think the two dividend cuts were very different from one another. I’m looking forward to getting up to your level of income. €480 would pay my rent for the month and then some, ha! Good to see your back, not that I am really pushing myself to write a lot either. Good job with your gains, picking up steam over last year. Increased tax and cuts (I have KMI too) hurt, but we forge forward and rock financial freedom. Glad to be back! I’ve missed writing and interacting with everyone. I’m sorry to hear you were in the KMI boat too, but since our portfolios are pretty diversified I’m sure we’ll both overcome the dividend cut in due time. Onward and upward!